Call it prose that is inextricable from the form it inhabits. An idea-based means of art-communication relying equally on language and image. Visual Essays are the things I am trying to name when I engage with a piece of writing that uses visual elements to further its thinking. Elsewhere known as a graphic/video/typographic essay, a comic, an artist's book, a public art text, prose graffiti, concrete prose poetry, etc. the visual essay is not a new form, just one that we have a lot of words for naming with very little streamlining between disciplines. I've heard it said that the work of design is to communicate efficiently, while the work of language is to do the same effectively. If these are opposing acts it means that a visual essay, in essence, is a battle for our attentions between two very different beasts. One we are made to watch or, I think, in the best VAs, to throw down in ourselves. But I'm not convinced that art, even design, is always interested in efficiency, or that what we thought was a battle of media doesn't often prove to be a conjugal visit after all. But I'm not sure how to talk about the difference yet, how critique work that slides into slender interdisciplinary crevices or falls half-uninterrogated in writing workshops and design studios. What we seem to lack is a language of craft that explains when these combinations are working, and when they are not. 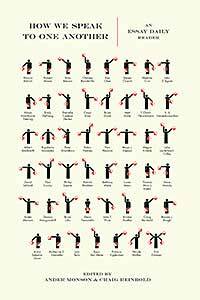 How does a conceptually dense text manage the additional complicating factors of form? Is the essay best fit for multimedia works because the act of trying is grappled with visually? How much of this is just about the amount of each media displayed? In this series of interviews with essayists who incorporate visuals—graphics, design, video, comics, photographs...—I'll be prodding both sides of some brains for ideas about process, and for new language to examine the nuts and bolts behind the craft of combining media. The first of these conversations is with Marian Bantjes. S: “I Wonder” is a collection of essays involving visual elements like typography, photography, hand-drawn text and illustrations. These visuals are delicate, intricate, sometimes beautiful, other times jarring, but their work is not just that of aesthetic satisfaction. In each of your essays, the design material expands upon, illustrates and mimics the conceptual work happening in the text it accompanies. Often, it seems like the designed elements are having their own private joke that elaborates on ideas in the text, enacting visual puns alongside textual. Throughout the collection, your critique and mimicry of modernism is conveyed equally through text and image. I’m especially interested in how you convey a number of tones and develop ideas using both language and design. Do you begin a piece by writing or by designing? At what point in the process of an essay do both text and visuals come into play? M: I definitely begin by writing, although I may have visuals in mind before I write, and it may help me touch on various themes, but the words come first. However, the words will often change after I've started designing the visuals. 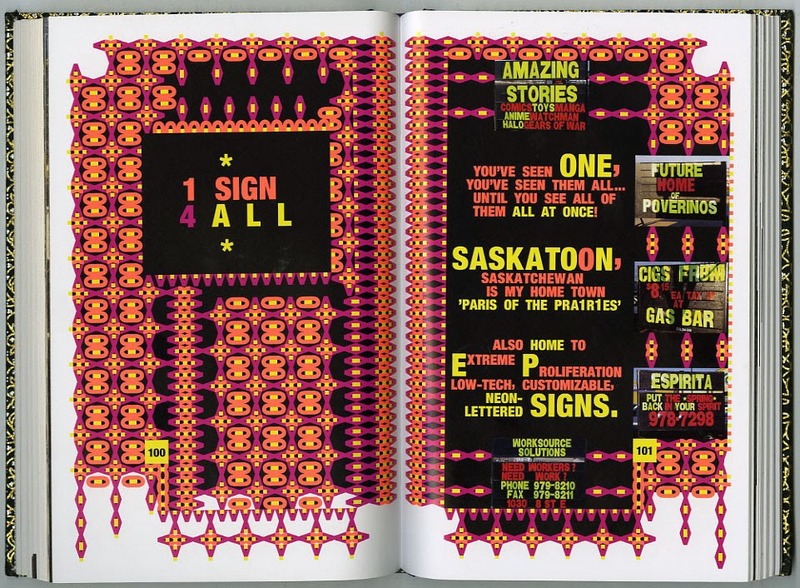 A case in point is the chapter "1 Sign 4 All" on signs in my hometown of Saskatoon. This was one of the "essays" in the book that started out as a blog post, and was written initially in sentences and paragraphs with supporting photographs. At some point in the process of translating it to the page I had the idea of rewriting the text to both look like and be in the vernacular of signage. Thus this became the most integrated piece in the book where there is a complete crossover between text and image. S: That was definitely the essay that I was referring to when I called some of the designs jarring. Are you ever concerned that combining prose and design might signal to a reader that the prose is secondary to the images? Or that they need not invest deeply in the ideas in the text? Do you try to push back against this inclination? M: I think that there is a perception that illustrated text is less serious - or not as worth paying attention to than unillustrated text, which is unfortunate. I tend not to worry what people think so much as put it in front of them and make them figure it out. I think that much of my approach came from a continual frustration that I have with writings about visual subjects. I always seem to be reading something that talks about - even describes - something visual and never shows it (or shows it pages later in a special section of images), it almost makes me scream with frustration. This is not the case in John Berger's book 'Ways of Seeing'. There, the visuals interrupt the text always at the point where they are mentioned. This is a welcome change, but the images are visually abrupt and awkward. I had an idea a few years back that *someone* (not me) should do a history book that integrates the writing style, the visual written style (fonts, design etc. of the era), with art and images of the era, so that as much as possible when you are reading about e.g. the turn of the last century, you are immersed in the style of that century. So that you have a full experience of the information from an immersive visual perspective. 'I Wonder' started as a group of quirky, somewhat design-related articles that I had written for a website a few years previous. Having observed and read other people's books that were reprints from blog writings, I was surprised that nothing was made of the transition from web to book. It got me to thinking about the differences between web and book, and the possibilities that the book had to create this visual immersion that I had been thinking about. 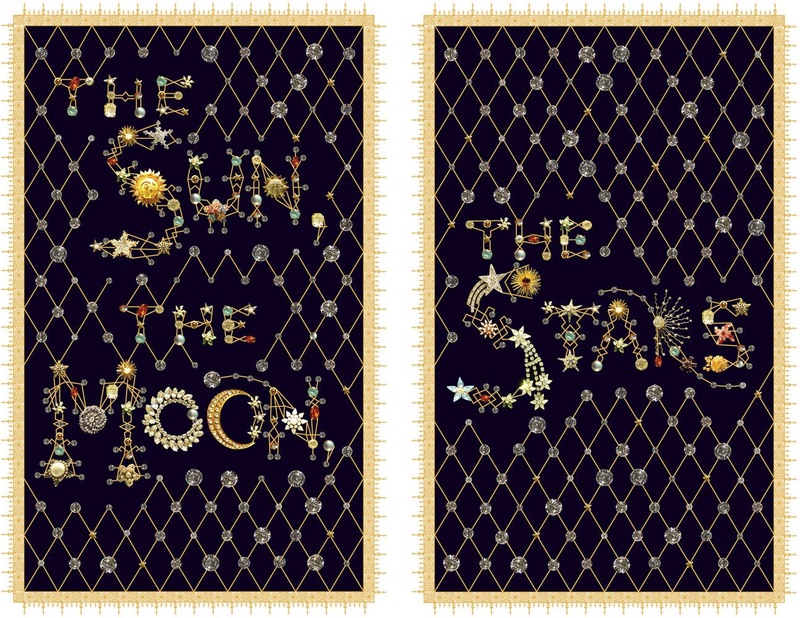 "The Sun, the Moon, the Stars" was the first one I tackled in this manner and I was thrilled with the result: it has the appearance of stars and jewels at the same time, and the integration of the source of the material (which was a display of celestial-themed jewelery at the Griffiths Observatory in LA) with my whimsical imaginings. To me this proved my point completely - how much more satisfying, more delightful the silly essay was in this manner. S: In your introduction you write a little about the intentionality of printing these pieces in a book rather than on the web. Though, theoretically, each piece could be reproduced electronically using fewer materials. Can you talk about the importance of a reader engaging with your work in hardcopy? Why does this matter for you and for the essays? M: While the web has many advantages I don't think the contemplation of images is one of them. The key word there is "contemplation". The web is, of course full of all sorts of wonderful, startling, beautiful images, and an RGB backlit display is a great way to see them, but we tend to look and move on. Occasionally, one or two images may cause us to pause for a while, but it lacks the ability to cause us to look at length, explore and look again. I can't imagine a book like 'I Wonder' being sustainable on the web. It might be nice on a large tablet, but I don't know of such a thing. 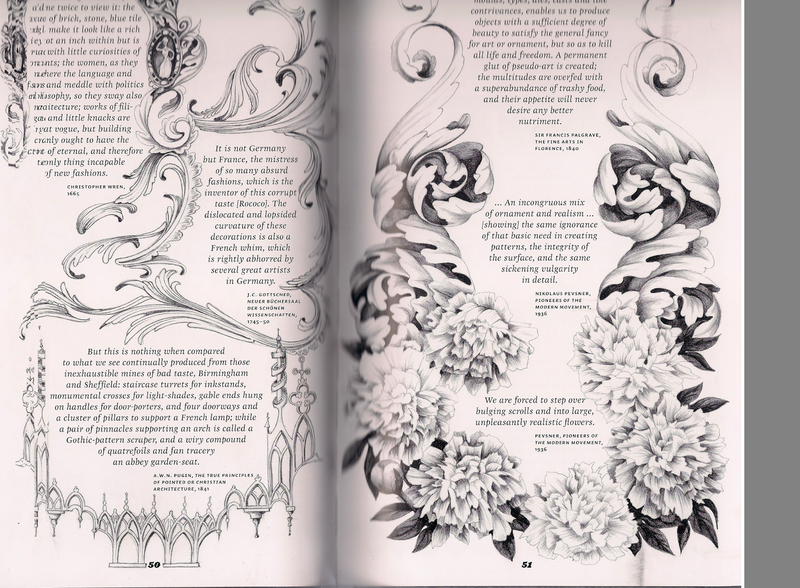 There is something nice about a page spread (the 2 pages of a book, side by side). Even at a relatively small book size, like 'I Wonder' there's a fair amount of real estate there, and printing allows for extremely good resolution of images. A book has a sense of a whole that an e-book never has to me. When I read books on my iPad I have a feeling of isolation, as though I'm viewing the book through a pinhole. When I have a book in my hands, I have a constant sense of where I am in it, and a very easy ability to flip back to remind myself where i came from or flip forward to see where i might be going. For 'I Wonder' I made a conscious decision to use printing techniques to my advantage, to create something that felt precious and desirable in a way that could only be an analog artifact. It's printed in full colour with a metallic gold throughout, it has a rich gold foiled cover and gold page edges. Yes, it owes a lot to illuminated manuscripts: they were my original inspiration for the book. Ultimately, in the spirit of not just talking about, but *doing*, I felt it imperative that if I were going to write a book about Wonder that it had to itself be an object of wonder. To *not* make it so would seem almost hypocritical to me. S: Let’s get to some specifics--“The Politics of Ornament” enacts visual F-yous to the critics of ornament that are tailored to individually offend each of the quotes the designs enclose. Your voice is present only in design, rather than in language there. 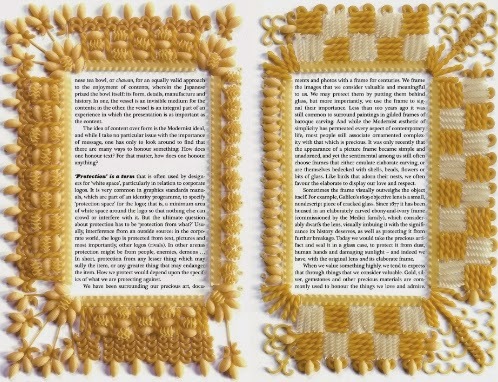 On the other hand “Honour” arranges pasta designs in the very framed-space its text addresses—maybe the opposite move, though each goes far beyond direct illustration of ideas. In my experience many writers working today are still at a loss for a vocabulary with which to discuss and critique the craft behind multimedia texts. I might call the craft in your essay on stars something like “ visual personification” or “the enacting of” a subject through the marriage of text and image. Do you have a word, or a way to describe what exactly is going on between the macaroni frames and the text in “Honour”? How is this different from what is happening between text + design in “Ye Olde Graphic Designer”? M: The word I use for what I've been doing with this is "integration" or "integration between word and text" or sometimes "a symbiotic relationship between word and text" … the point being that one is not the same or as rewarding without the other. To this end, "1 Sign 4 All" is the most integrated; "The Sun, the Moon, the Stars" is next … "Honour" does what Honour talks about, which is to honour the text with a frame - this is the same as writing a book about Wonder and making it an artifact of Wonder at the same time. To not frame the text of the chapter on "Honour" - and in a laborious way, made by hand that gives it the value of my time - as I write about in the chapter, would be hypocritical. "Ye Olde Graphic Designer" is much closer to mere illustration. The graphics illustrate the things I'm talking about in the text, but instead of putting them in boxes, they are worked into a surround. But there's no real reason for them to be, other than to work with the other chapters in the book and contribute to the style of the book. S: Speaking of, in “Ye Olde Graphic Designer” you pose the theory that logo-designers and the companies who hire them should apply the rules of heraldry to logo making as a means of aesthetic regulation or streamlining. Do you think we could also apply these rules to the practice of combining of prose and visuals? What might this look like, for you? 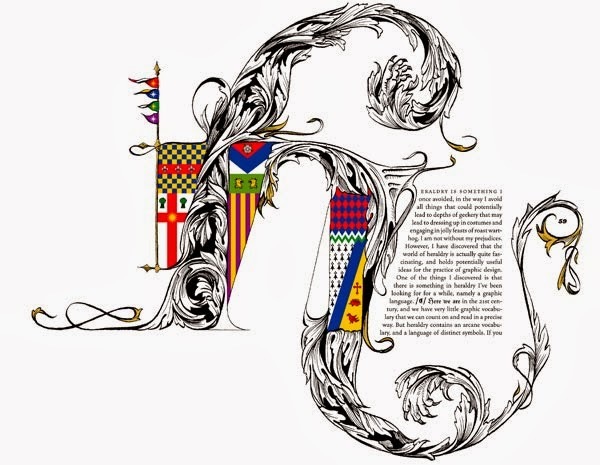 M: "Ye Olde Graphic Designer" was written tounge-in-cheek (mostly), and came directly from my discovery of the graphic language that exists in heraldry. While one could conceivably create a list of rules for combining prose and visuals, I can't see the relationship to heraldry. And besides, I'm a rule-breaker. S: It seems like maybe rule-breaking is inherently involved in or required by the combination of various media. Have you been inspired to do this by other makers of visual essays? You address this a bit in your book, but is there anyone else in the design world, currently or historically, who you feel is doing similar work with prose? M: Well, obviously the illuminated manuscripts - I think what intrigues me about them most are that sometimes there is a direct interplay between the text and the illuminations. Characters in the margins sometimes climb the text and reach in to fix typos; there are jokes in there, and visual play. It is this interaction between the two that interests me: text and image are friends: one is not slave to the other. I find it quite difficult to find examples of this symbiosis. It's not easy to do - it really seems to require both a visual and literary mind. I'm not sure how well I could do this with someone else's text, because I imagine I would be wanting to change it in places to create the right amount of interplay. Being a writer, a visual artist and a designer allowed me to make a book that would have been very difficult to make otherwise - for instance in "Ye Olde Graphic Designer" setting text into points like that is nigh on impossible without rewriting the text to fit into corners – which is what I did. I suppose interactive books like "Griffin & Sabine" easily fall into this category - for some reason I didn't like those books. I don't know why. There is one book that I absolutely love called "Women's World" by Graham Rawle. It's a work of staggering genius: a novel created entirely in word collage, where all the words and short pharases are cut out of women's magazines. While this could be a gimmick remarkable only for the massive amount of work it took, in actuality the most fascinating thing is how the language of the magazines has informed the feel and the narrative of the book. Reading it, you are steeped in a world of skirts and perfume in a way that is utterly magical. And again, this book would not be the same if typeset. It's partly the visuals of the words that transports you somewhere else. And, it's a ripping good read! Marian Bantjes is a designer, typographer, writer and illustrator working internationally from her base on a small island off the west coast of Canada, near Vancouver. She is a member of Alliance Graphique Internationale (AGI), and regularly speaks about her work and thoughts at conferences and events worldwide. Her 2010 book “I Wonder" (published by Thames & Hudson, 2010) is an exploration of the marriage of word and image, written and illuminated by herself. It, along with several other pieces or her work, is included in the permanent collection of the Cooper-Hewitt National Design Museum (Smithsonian) in New York. Her retrospective book "Pretty Pictures" (Thames & Hudson, 2013) contains about 800 full color images from a decade of work. More at her website. Sarah Minor is from Iowa and recently earned her MFA in Creative Nonfiction from the University of Arizona in Tucson, where she is at work on one collection of visual essays and another of visual essayists. Her work can be found or is forthcoming at Word Riot, in Conjunctions 61, South Loop Review, Seneca Review, and Black Warrior Review. More here soon.